He's the one who wants to be with you. Deep inside we hope you want to, too. This is Mr. Big, he’s the one who wants to be with you. Deep inside we hope you want to, too. Brace yourself, this guy is large and strong… but he’s SUCH a sweetie pie. He just has no idea that he can practically drag you through the yard if he wants to. Mr. Big pulls hard on leash when he wants to, but at other times will walk fairly nice on leash. Off leash he’s a total sweetie. Just a loving boy who wants to lean in for petting and give you kisses. He can get distracted by all the things going on around him, but always comes back to you for more petting and affection. Mr. Big loves treats and takes them soooo well. He’s not pushy or begs for them, just when you have them he’s front and center, ready and waiting. You’d think he’d be super-energetic in a playlot, but he’s not. He’ll chase a ball or two, but prefers to walk around, sniff some things and follow you for treats. 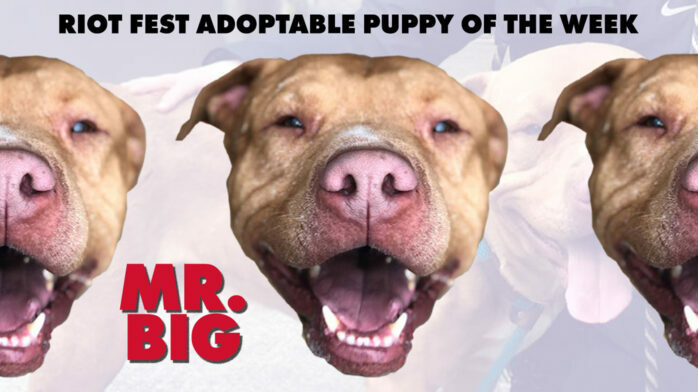 Mr. Big is a strong boy, so be prepared to build your muscles walking our buddy. He can be reactive to other dogs on leash, but he’s been doing much better with some work with our volunteers. He’d do great in a yard of his own where he could bask in the sunshine. and we can also imagine cuddling on a comfy couch. Mr. Big should likely be your only pet at this time. Chicago Animal care and Control is having an adoption event called “Game of Bones” and adoption fees are waived for the featured dogs.